The 'Alistair McCulloch Trio' annual summer Scottish tour has become a firm fixture on the folk music calendar. 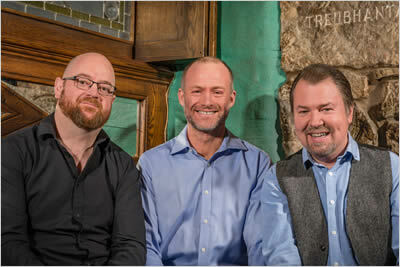 Featuring champion fiddler McCulloch, alongside past Scottish folk musician of the year, Aaron Jones of Old Blind Dogs and the Kate Rusby Band on bouzouki, guitar and vocals and former Capercaillie whistle wizard Marc Duff, the trio has gained a formidable reputation for its dynamic concert performances. Collectively Alistair, Marc and Aaron have appeared on dozens of albums over the years and after many requests they have finally recorded a studio album as a trio. From driving reels and jigs to tender airs and expressive songs, ‘Off the Hook’ perfectly encapsulates the feel of their live shows. Blending traditional, contemporary and self-penned material the album showcases the combined talents of three of Scotland’s most respected and established traditional musicians. For bookings please contact Alistair.